We are very proud that the prestigious organization “CEO Monthly” has awarded the title of “CEO of the Year 2017 – Netherlands” to our Chief Executive Officer, Menzo Havenga. Menzo was chosen on merit, and a clear vision and strategy. The selection of CEO of the Year is based on a combination of external votes and CEO Monthly’s rigorous in-house research program that screens CEO performance over a period of 12 months and commitment to innovation. 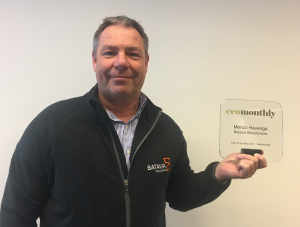 In the full article by CEO Monthly, Menzo reflects on the role of his staff in Batavia Biosciences’ success, his role as a CEO, his ambition and his drive.